Also, check out their wonderful sushi blog, "Sushi Otaku"
The next chapter begins a new story arc. Rakuto finally uses his "Anything" coupon and Azuma stumbles onto Rakuto's secret connection to Sachie ... look forward to it! 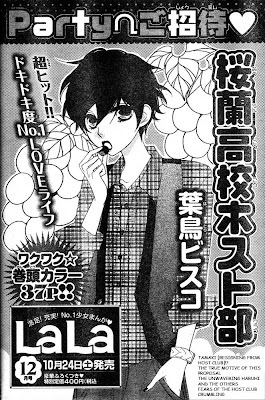 Here's are the previews for Ouran High School Host Club, Chp 75 from Lala 11/2009. It looks like we'll be treated to a long chapter with 37-pages. Chp 75 will release on 10/24/2009. 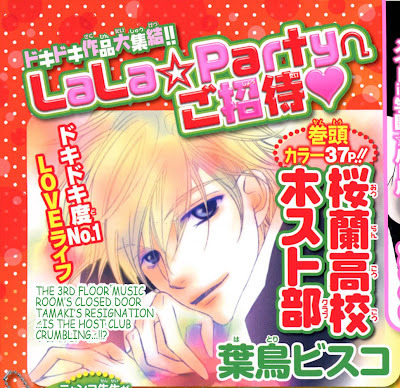 Here's a short Ouran High School Host Club side story that was published in Lala DX last May. Hopefully this will give you the little fix needed to make-up for the lack of an September Ouran chapter. This bonus chapter is very cute and features Kanazuki, Hani, Haruhi, and the twins. I don't know about you guys, but 2-months is a while to wait for an Ouran fix, so I've decided to do the side story from the Lala DX 5/2009 next before moving onto Arakure chp 45. This little story will give you some clue about Hani's love life. The next chapter is really emotional and the chapter after that, we get some more movement with Sachie and Rakuto as Rakuto finally uses his "Anything" coupon. Heheheh ... Look forward to it! http://omaris-sister.blogspot.com/2010/02/wild-ones-arakure-volume-9-is-out-from.htmlHere is chapter 43. In this chapter we learn a little more about Rakuto's past and Sachie begins to show more of her feelings towards Igarashi. It's an important chapter and from looking at the chapters ahead, I think this may be climax of the story. Yep, we're coming to the end, but it's a drawn out ending over the next 14 chapters, so don't get sad it's ending yet. As for what's next ... well, there are a couple of Ouran side stories from Lala DX that haven't been translated yet, so I'm thinking of doing those next and then returning to Arakure. Let me know what you think. I need some help with QA/Proofreading. I currently average about one release a week and I would like to keep that pace. Also, there's no pay involved, so you'd be doing this out of the goodness of your heart. If I could get 2 or 3 dependable people that would be great! I imagine you would not spend anymore than 15 - 30-mins per release. If you are interested, leave me comment or send me some e-mail. Update: 09/12/2009 -- Thanks to yourojousama who noticed page 21 was missing. I have added page 21 to the original file. It can be downloaded via the link below. Here's Arakure Chp 42. We see some more progress between Sachie and Rakuto. It seems that it's Sachie's turn to start figuring out how she feels. This story arc goes for quite a few a chapters, so hang in there while I will do my best to get them out in a timely manner, since I, too, am eager to know how this will all turn out. Haha!! Rest assured volume 8 will be out in the US from Viz in early October. At that time I will kill the links, and all of you who can, should go and support the author by purchasing the manga. As usual, please do not upload this to any of the manga aggregator sites without my permission. Also, if you detect any errors, please leave me a comment or a kind e-mail and I will address the error ASAP. Are you finding that your paper dictionaries don't have half of the words you are looking for when you are translating manga? Well, here are some suggestions for you. In the course of struggling through translating, I have found some online resources that have been a great help to me. The most helpful I've found so far is a website called "Tangorin." It's by far the deepest online dictionary resource I've found so far. It even has many of the idiomatic words in its database. This dictionary contains several examples of word usage (20+), breakdowns of the kanji, a list of similar words, and the ability to save words to a vocabulary list. It really is a great resource and it saves me a lot of time compared to using my phonebook sized kanji dictionary. I still haven't found a good online source for grammar, but I did just purchase and fundamental and comprehensive Japanese grammar reference books -- no, not those little ones from Kodansha, but some real substantial references (Man! were they pricey!). I'll report on those once I have picked through them.